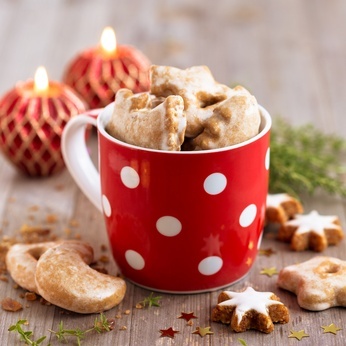 Lebkuchen is a gorgeously spicy German biscuit not very unlike gingerbread, which is traditionally made at Christmas. These biscuits will store for up to three weeks in an airtight container. In a very large pan, melt the butter along with the honey, treacle and sugar over a gentle heat. Once melted and mixed well remove from heat and set aside. Beat the eggs in a small bowl and set aside. In a bowl sift flour, salt, bicarbonate of soda and spices. Add half of the beaten eggs, and half of the flour mixture to your very large pan of melted ingredients and mix well. Repeat with the second half of the eggs and flour mixtures. Mix well. Add the almonds and zest and mix thoroughly. Transfer the mixture into a plastic bowl or bag and chill in the fridge overnight. The following day (or even up to three days later), roll the dough out onto greaseproof paper and cut into whatever cutter shapes you desire. Space them out well on a baking tray as they will spread as they bake. Bake for approximately eight minutes or until a golden-brown colour. Remove from oven and allow to cool for a few minutes before transferring onto a wire baking rack to cool completely. Once completely cooled you can prepare the icing for the top of your biscuits. Mix up the icing sugar with the juice and extract. It should be quite watery. Coat the tops of the biscuits and allow to dry slightly before coating a second time. Allow to dry then store in an airtight container.